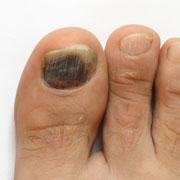 Many times if toenails apear thickened, or discolored, you automatically assume it is a fungus. However there may be other causes for the appearance of the nails. In fact, often times a patient has come and seen me with a diagnosis of fungal nails from another physician. They have tried all sorts of medications, and have even tried an oral medication, with no change in the nail's appearance. My question was to the patient, are you sure your are treating a fungus? Turns out, after a biopsy done in the office, the nail was not infected with a fungus; that's why the anti fungal medications did not work! What else could it be? Trauma to the nail - after an accident, something falling on your toe, or stubing your toe, the nail can appear discolored and sometimes painful. The nailbed area will heal, but often it can look like a fungal infected nail until the nail either falls off or affected area grows out. Repetitive microtrauma to the nail- sometimes it is not just something heavy dropping on the foot, but sometimes after a very aggressive pedicure, or after wearing tight shoes for a while, the nail can look affected. Again, it will take a while for the nail to grow out, but it can look like a fungal infection. Psoriasis - patients with psoriasis or psoriatic arthritis may have nails that appear to have pitted little holes that cause a white discoloration. This may be controlled by controling the underlying disease. If you have a question about your nails, make an appointment with one of our doctors at 630-834-3668. After a throrough exam and a biopsy, you willl be able to start treatment.